There’s no appreciable difference between an out of bounds skier and most other rescues SAR does. Aside from the fact that out of bounds skiers represent a very small number of the total rescues BC SAR teams do in a year (<2%) — a fact belied by the overwhelming scrutiny that Vancouver media put on those lost in the local ski areas – an out of bounds skier basically suffers from the same problem as most other people we rescue. That, in a nutshell, is ignorance. Seriously? When ski hills expressly advertise using shots of skiers shredding pow outside their boundaries? When the big hills like Whistler and Backcomb talk about their “slackcountry“? When Coors Light (and pretty much every damn beer commercial in the winter) advertise people skiing out of bounds? When locals “in the know” constantly ski outside the bounds in all conditions? Just google Cypress Skackcountry – or just look at those ropes and all of the ski tracks you see on the other side. How is a sad and out of touch wannabe skier to know that all the other tracks going under the ropes aren’t an implicitly condoned activity? There are dozens of other factors that cause people to feed into the Search and Rescue flow chart, but ignorance is the main one. The others include bad luck (injury, heath, or unpredictable event) or infirmity (dementia and other cognitive issues). But back to the out of bounds skier. What sets him or her apart from the other skiers who set the tracks beyond the boundaries that we didn’t have to rescue? The other skiers knew the conditions. They went earlier in the day. They carried a GPS. They went with a friend who knew the terrain. They knew the route, and when to traverse back in bounds. They understood that the route was well within their abilities. Or perhaps the other skiers were just lucky? The saddest thing I see when a high profile out of bounds skier is rescued is the equally ignorant cries from the public to charge them for rescue or leave them to die. The ironic thing is that most of those calling for such treatment are exactly the people we rescue – badly informed, overly confident in their abilities and more vulnerable than most to making the same mistake as the person they are commenting on. I almost hesitate to mention to my informed readers that there is near universal condemnation of charging for rescue from every SAR agency I can think of. In my (and most other SAR member’s opinions) there’s nothing about charging for rescue would do anything to prevent anyone from needing rescue, and it would probably make our jobs harder and hence more dangerous. The cure for ignorance is the same as it always has been – education. Here in BC with thousands of outdoor lovers needing rescue every year we would do well to make a basic backcountry safety course part of our educational curriculum. Those courses already exist and are only a few hours long. The group responsible for this was created by the BC SAR community (BCSARA) and is called AdventureSmart. Now a national program, it’s time to make it a mandatory one in our province. Regardless of the public sentiment which seems to come out every winter, you’d be hard pressed to make a case that charging for rescue will have any impact on a person’s level of risk acceptance. Any delay in initiating a search creates a cascade of other problems, so having your subjects take pause for fear of getting billed is naturally going to increase effort and associated risk for SAR. Education on the other hand has a great chance to help with two of your three bulk categories around who feeds into needing SAR. In addition to the obvious impact for the ignorant category, education can help mitigate many of the risks within the ‘bad luck’ group. Education can’t eliminate the chance of getting an unexpected injury, but the educated group who properly pre-plans can often help themselves. At the very least they will be prepared enough to lower the search urgency. As with SAR in general, long term stable funding of the AdventureSmart program. While i was extremely excited to see funding restore some of the AdventureSmart resources this year, if it dies the next time the program’s funding dries up, we really don’t have a long term solution for anything. I think people that have to be rescued because of ignorance should be charged a fee. Or repay that fee with donated time with future rescues. So they can learn their ignorance has effected other people’s life’s. However, it’s been shown that when there’s a “punishment” for requiring rescue, the people delay calling for help. Sometimes they call their friends instead. This risks even more lives, and ultimately when SAR is called out we’re face with a tougher situation – and it risks our lives as well. Charging for rescue does not help, it makes my job harder. I have been injured twice in the back country and never made the call. Always dragged myself out. I have also called SAR on behalf of a man that would have lost his life and put his 16 year old partner on the trip in a bad spot had SAR not been there at the moment of the call. I think for the most part people who go out set for the back country are going out prepared and educated and those that end up calling SAR have made bad choices, unplanned changes to their itinerary and or had an accident. Over the weekend one of our party had a pretty bad sprain but manged to ski out the 7km required to get back to the vehicles. Comes I hope to never need SAR and will always use them for emergency only. I think the article is spot on when it says people need to get educated and make educated choices. Good article. I’ll bite. Can you post a link to WB produced marketing that refers to the slackcountry. 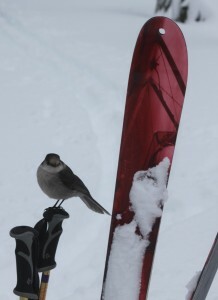 The definition of Slackcountry from WildSnow is backcountry terrain easily accessed from a resort (https://www.wildsnow.com/1224/definition-backcountry-skiing/). Whistler-Blackcomb explicity promotes access to the area beyond it’s boundaries as part of their marketing campaigns. I do note that they do their best to educate people as to the risks and the need for proper training and information on snow conditions – in this they are a lot more responsible that most. However, to the general public the perception is that the backcountry is open. The fact is that leaving the ski area is not illegal and is a condoned activity at Whistler, and at many other ski hills. Every skier I know including every SAR person has skied out of bounds at all of these resorts. The only difference between a us and a skier that needs rescue is that we have more training and are less ignorant about the conditions and our ability to handle them. The WB back country page is info, not marketing. All the others are not WB. I’ve seen marketing shots from Cypress where the photo was clearly outside their boundaries – that was what the comment referred to. Who cares about Cypress. You clearly implied WB are doing the same thing. They aren’t. We all know that the ski industry including the resorts and the magazines thrive on those shots of skiers in untracked powder. Yes, Untracked powder in bounds. We have no need to do out of bounds shots for marketing. Unsurprisingly we have lots of opportunities in the 8000+ acres inside the ropes. I don’t believe I’m being misleading because there’s a ton of evidence Whistler expressly promotes both backcountry skiing and their “in bounds backcountry” experience. Please show me your “ton” of evidence from WB? A bunch of bloggers do not constitute WB marketing. Note I never said that this was irresposible! There’s absolutely nothing illegal about backcountry skiing and I’d go further to say that there’s nothing illegal about jumping the ropes. The issue is ignorance. I think Whistler is responsible in that they provide explicit instructions on how to get to the backcountry, what the conditions are, and how to hire a guide. I respect that. Again show me these “instructions” ? You don’t need any. Just go under the rope anywhere. You clearly implied WB are trying to make money by encouraging people to go through the ropes. Again the issue is ignorance. The guy or girl standing at the ropes is a product of decades of advertising about what skiing is and they are lusting for it. In their heads is every ski movie, every ad, every photo on the web site and visions of untracked snow. They see the tracks of other people who’ve done the same thing and in their uninformed minds they don’t see the difference between their abilities, and the skill level of the people who made the tracks. Ultimately it’s a pretty simple story. I am being no more misleading than the marketing BS. You are attempting to blame WB for this. Unfortunately we won’t accept the blame for the poor decision making of some of our guests. What I said was that WB clearly markets their backcountry experience. I’d ask you do me the kindness of reading what I wrote rather than reacting to what you think I implied. I’ve provided all evidence I feel I need to and if you’re not convinced that’s fine, you’re entitled to your opinion. My only question to you is why do you feel like you need to defend them? I don’t feel tha there’s anything unethical in their actions, but clearly you do – or is your problem with something else? The entire outdoor industry promotes a vision of backcountry adventure that’s unobtainable by most people. This feeds into beer and car commercials that try to tie in to the “extreme” nature of the sport. It’s only natural that these companies do this and for the most part although I roll my eyes at it, I see no problem as long as there’s an equal push to educate people that those activities require specialized training etc. My point – which I hesitate to repeat, but I feel I need to – is ignorance on the part of the skier (or hiker, sledder, paddler, etc). They see the “promotion” of the outdoor activity. They see others doing it, and they can’t connect the dots between what they see, the conditions and their own abilities. Ultimately, as there are so few skiers that need rescuing compared to the numbers that participate in the sport, and based on the tracks, the numbers that leave the ski area boundary, I think that the problem is over blown. The only reason it gets any attention at all is because of the proximity to Vancouver, and the that the consequences are higher due to low temperatures. can you elaborate on “bring too much gear” ? Bringing too much gear is kind of an offhand comment, but it happens with inexperienced skiers. I recall my own early ski tours were misery festivals with heavy packs and too much stuff. The opposite of not having enough gear is taking too much – because you don’t know how much you need. Just a different expression of ignorance. On my earliest ski tours I took too heavy a jacket for our mild western winter – hovering at -5 to -10 I didn’t need a huge jacket. I brought too much food and water for my day trips. My over night trips were a nightmare! Another variation is taking the wrong kind of gear – a down jacket for instance when it’s near zero degrees will soak through. A three season tent in the winter can be terrible. Back in the day we were told by sales people that plastic skins were acceptible (thankfully they don’t make them any more). Way back I recall some dedicated snowboarders who hiked in without snowshoes to the Elfin Lakes hut with a bag of potatoes for food. I disagree Rob. Everything that goes on that web site goes through the marketing and communications group at Whistler-Blackcomb. It’s carefully managed image making. The lifestyle reporters are courted and comped rooms and tickets to write about their experiences in the Globe. Of all of the ski hills Whistler does the best job of informing people about the hazards, but they also benefit and explicitly market the ability to ski the backcountry around Whistler – they even marked paid tours! From your original post, “When ski hills expressly advertise using shots of skiers shredding pow outside their boundaries?” WB do not. You are factually incorrect, and misleading readers to think WB are acting irresponsibly. I take issue with this. Also the marketing you refer to is for guided trips, which are not the problem we are referring to. Marketing by others I don’t care about, it’s a free country. I’ve seen marketing shots from Cypress where the photo was clearly outside their boundaries – that was what the comment referred to. We all know that the ski industry including the resorts and the magazines thrive on those shots of skiers in untracked powder. I don’t believe I’m being misleading because there’s a ton of evidence Whistler expressly promotes both backcountry skiing and their “in bounds backcountry” experience. Note I never said that this was irresposible! There’s absolutely nothing illegal about backcountry skiing and I’d go further to say that there’s nothing illegal about jumping the ropes. The issue is ignorance. I think Whistler is responsible in that they provide explicit instructions on how to get to the backcountry, what the conditions are, and how to hire a guide. I respect that. Ultimately it’s a pretty simple story. I am being no more misleading than the marketing BS. I recall WB using a photo of someone skiing, what I assumed to be Rainbow, with WB in the background. Sorry I don’t have an example but I remember referring to it when Kicking Horse was implementing a no identifiable backcountry shots for ads policy. Same here – I recall shots but they were either in print or I didn’t bother saving them. Other than being misleading advertizing there’s not much “wrong” with them – as I said the entire ski industry thrives on an image of skiing that’s different than what most people can experience without paying for a heli ski day. I’d love to hear more about Kicking Horse’s policy! Excellent article, Mike! In reading the comments on NSR’s recent post about “out of bounds” skiers, I don’t think a lot of the general public can process the complexities of backcountry travel in winter or the strange situation created when a foreign owned entity has a lift running up one side of a dome with ski touring terrain in the BC park on the other side. I think Baker and WB have done a good job with an open boundary policy, good education and the availability of guides (at WB at least). Education about how to go outdoors safely is the way forward. Great writing and all the best to you in the New Year. The public can’t tell the difference between an unprepared hiker or skier and one that’s just unfortunate but more importantly it doesn’t matter. Certainly when someone on the ski hill over estimates their ability and crashes, then requires medical attention, they’re costing our medical system and taxes more than the very few (by comparison) people we rescue from the backcountry. Of the approximately 1500 people rescued every year 2% (perhaps 30) are out of bounds skiers, and most of those are just cold and require little medical treatment. And yes, although I mentioned Whister’s explicit promotion of their backcountry experiences they are very good at making sure everyone who decides to use the ski hill to access the backcountry had multiple chances at being educated on the conditions they should expect, the equipment they should carry, and the training they should have. 1 Pings/Trackbacks for "Out of Bounds Skiers are not the problem"